In the 2017-18 track and field season, junior sprinter Artesha Richardson placed in the top ten in several events in the Conference USA indoor and outdoor championships, including a sixth-place finish in the outdoor championships as a part of the 4×100-meter relay team. Returning for the 2018-19 season, Richardson has a chance to improve on her accomplishments. Richardson is from the British island Anguilla, located in the Caribbean. Her development as a track and field sprinter is different in comparison to United States athletes, she didn’t have facilities or locations to compete in. Anguilla has a population of roughly 15,000 people – considerably smaller than UNT, which has over 38,000 students. While on vacation in the United States, Richardson came to North Texas to meet the director of track and field — Carl Sheffield — and discuss how she could be a part of the program and potentially earn a track and field scholarship. Richardson showed Sheffield a video of her running and he provided advice and insight on what Richardson could improve on. “[He said] I need to work on my form and my times need to go down and if I could do that by a certain time then I could get the full scholarship,” Richardson said. With Sheffield’s advice, Richardson set on improving herself as a track and field runner in order to receive a track and field scholarship from North Texas. Heading into the 2017-18 school year, Richardson received and accepted an offer to run track for the Mean Green. The transition to the United States and North Texas was certainly a major change for Richardson and at times, it was difficult. Through time, Richardson has adjusted to life in North Texas, especially with the help of her teammates on the track and field team. 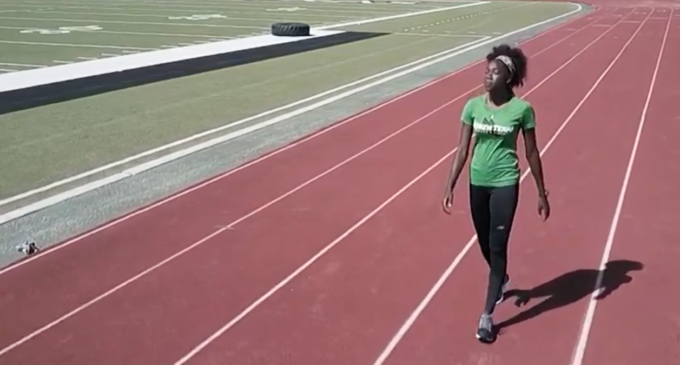 Junior sprinter Jahyda Dixon was Richardson’s roommate when she arrived to North Texas and has a first-hand account of Richardson’s development. The training at the collegiate level as compared to the training in Richardson’s home of Anguilla is more challenging and Richardson struggled with when she arrived to North Texas. “There were struggles, adapting to the training, going to the gym because we’re competitive in the gym and on the track so lifting weights is not my strongest point, so that was a struggle,” said Richardson. Communication was difficult for Richardson, but once she started to get better at bonding with her teammates, track became less of a struggle for her. “Once the communication between me and my coach got better, that made track easier,” said Richardson. Being from such a small nation like Anguilla and competing at the NCAA level, there is a sense of pride that Richardson carries for her home nation. Featured Image: Artesha Richardson. Courtesy Mean Green Sports.